A photo diary from Kaitlynn’s 30th birthday weekend in Santa Ynez. A photo diary from Capri June 2018. Ubud Traditional Art Market - Stock up on silk kimonos and straw bags! In my opinion, riding a scooter is the only way to experience Bali - especially in Seminyak! Nihiwatu is a very special resort experience on the island of Sumba, Indonesia. Travel time a short one hour plane flight from Bali, then a two hour car drive through a rural Sumbanese village. Staying at Nihi is more than just a hotel experience, it is a magical and spiritually awakening opportunity that will leave you feeling humbled. Surfing, Fishing, Spa Safari, Horseback Riding, contribute your time to the Sumba Foundation. Tcherassi Hotel - By Colombian fashion designer Silvia Tcherassi. Rosa Mezcal Taqueria - Fish tacos, hot pink walls, and margaritas - yes please. Townhouse - Rooftop craft cocktails. El Kilo - Cute decor with gorgeous marble bar and great drinks. Mistura - Peruvian Japanese food + music. Juan del Mar - Amazing street entertainment and shows while dining outside in the plaza. Order every kind of pizza! Pasteleria Mila - The best desserts in town. Try the cuatro leches. Epoca Cafe - Cute, casual cafe to grab a coffee or lunch. Take a day trip to the islands and book! 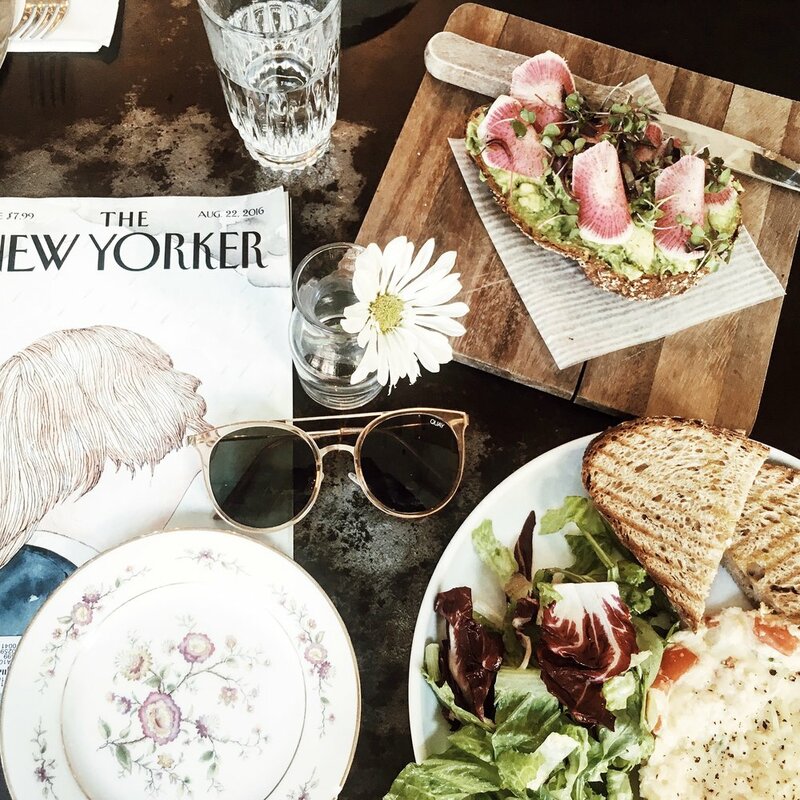 Check out THIS Vogue article for some of the best spots. We stayed at Isla Rosa.- a Barbie house IRL. 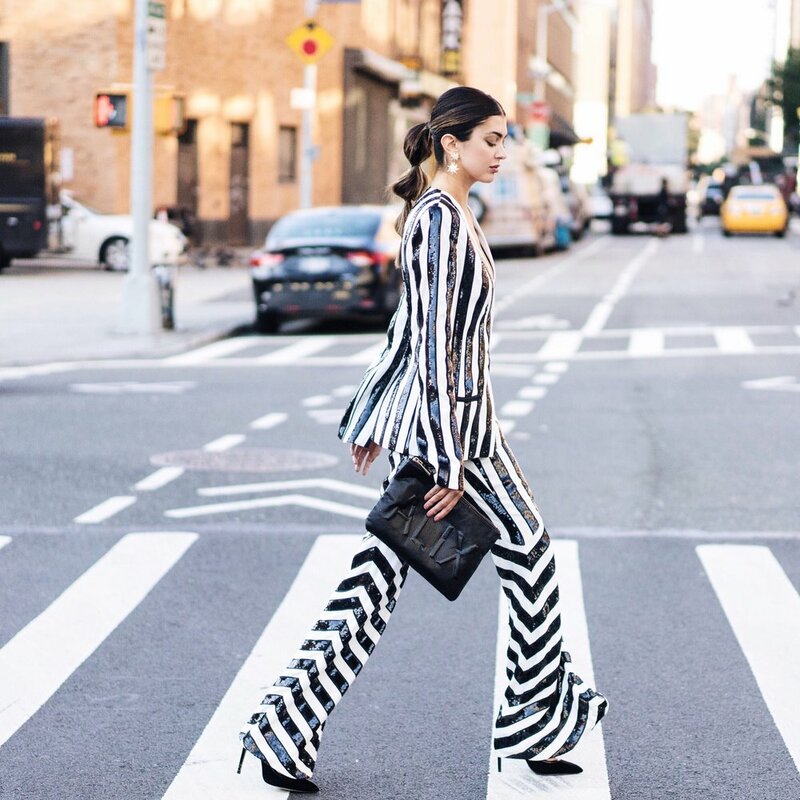 Sylvia Tcherassi - A local Colombian designer with feminine structured pieces. St. Dom - Discover luxury designer at it's finest. The store carries both women's & mens clothing and accessories. Street Shopping - For local souvenirs. Casa Malca - an iconic hotel & residence with a dangling sofa swing in the entrance that you cannot miss! Lake Como is one of the most magical places I have ever traveled to. It's peaceful, romantic, and timeless. Como living means exploring medieval remnants in stone villages like Bellagio and Varenna, and touring luxurious villas with rolling vineyards and olive trees. The best way to do it all? By boat, of course. The lake is very large, but you can easily catch ferries or water taxies to explore towns around the lake. Each town has it's own personality and charm. Some of my favorite towns include Bellagio, Tremezzo, and Varenna. Walk around the charming town of Bellagio and discover some of the best dining tucked away in the stairwells. Definitely check out the Italian silk shops and stock up on scarfs! The dreamy lakeside town of Tremezzo is just a 10 minute ferry ride from Bellagio. It also has two of the most breathtaking villas which you can tour, and one of the lake's grandest hotels. A low-key little town with scenic, lakefront dining. The brightly painted fishing village on the west side of the peninsula of Portofino, between Genoa and Cinque Terre. It's not a very well known American tourist destination (which I very much appreciated), and it is filled with local tourists from Italy. Camogli is just 2 hours from by car from Milan. Take a boat tour to Portofino with Portofino Water Taxi - ask for Andrea! The Turks & Caicos Islands are a vacation dream come true! White sand beaches, crystal clear turquoise water, and tropical tranquility, what's not to love? The journey to paradise is just a quick two hour flight from Miami to Providenciales airport. In May of 2017, I traveled to Grace Bay Club with Foray Collective and had the most incredible experience! It was my first time in Turks & Caicos and I was really excited to explore this beachy new destination with my friends; Ruslana Gee, Jourdan Sloane, Rosa Crespo. After a long day of traveling from LA, we checked into our luxurious room in "The Estate" building, which had a large balcony overlooking the ocean and main pool. We watched the sunset and had dinner at one of the "Private Villa Collection" beachfront homes owned by Grace Bay Club. The modern villa was breathtaking and had amazing atmosphere to kick off the trip! The next day, we headed to Bugaloo's Conch Shack to have lunch, dance to local music, and explore the conch studded island. We spent the entire day here hanging out (the photo opps with the colorful houses were just too good). After a day of sun, we headed to Grace Bay Club's Anani Spa for massages and facials. My facialist was really educated in the products she was using and my skin felt heavenly afterwards! I highly recommend going to the spa if you visit Grace Bay. On our third day, we took a charter boat out to sea to check out some other islands. The sand was SO white and fluffy and the water was the prettiest shade of turquoise I have ever seen! We were also lucky enough to see a few dolphins and stingrays along the way. 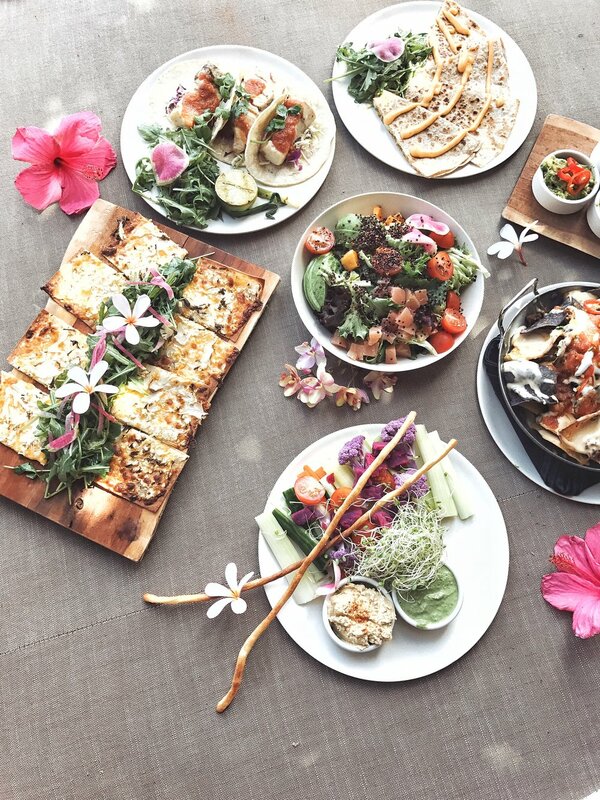 Once we wrapped up the boat tour, lunch was served local style at STIX on the beach. The remainder of the day was spent relaxing and swimming in the ocean. Dinner was set up beautifully on the beach by the Grace Bay Club team where we had delicious food, great conversation, and lots of wine to wrap up our final night. Turks and Caicos is one of the most beautiful places I have ever been to and I highly advise making the visit out! Check out my travel guide and recommendations below! Lemon2Go Coffee Bar - the cutest little coffee + gift shop just 2 minutes from Grace Club. The almond milk latte is delicious! Foray partnered with the brand Maaji for this getaway, hosting a group of bloggers to help bring awareness to the brand. Jill Wallace, Nicole Isaacs, Julia Friedman, Racquel Natasha, Kaitlynn Carter, and myself all came along for the journey. Maaji is a Colombian based resort & activewear label known for their reversible swimwear and bright, colorful prints. I was a fan of the brand before, but knowing the roots and the kind people behind the brand made me fall in love with it even more. We stayed in a beautiful 4 bedroom villa right in the heart of old town Cartagena, complete with a dreamy rooftop lounge. Unfortunately, this house is not available for booking, but I've listed a few alternative recommendations below! The Maaji team organized a full itinerary of activities for us to experience while we were in Cartagena. It was an awesome benefit to have local knowledge from the team for the best spots in town. I've included some of my favorite places below! Tcherassi Hotel - Designed by Colombian fashion designer Silvia Tcherassi. Take a boat the is islands - Islas de Rosario, Baru. Cafe Del Mar - Go to watch the sunset and have drinks. Walk/bike ride the old city streets. Crepes & Waffles - Casual dining, ice cream & juices. St. Dom - Discover local Colombia designers. The store carries both women's & mens clothing and accessories. Everything is SO cute. NH Galeria - High end fashion, art, and interior design. Lucy Jewelry - For Emeralds! Columbia is the world's largest producer. Abaco Liberia & Cafe - Books on the best art, photography, and architecture in Cartagena. El Baron - The best cocktail bar in Cartagena. La Movida - We went drinking and dancing almost every night here! They play the best Reggaetone music in the back room. Cafe Havana - For a night of salsa dancing! I will DEFINITELY be coming back to Colombia soon and hope to visit the city of Bogata. The people, the weather, the culture....Colombia you have my heart forever! Park City, round 2! Foray Collective made their annual trip to Park City for Sundance Film Festival this year and it was an absolute blast. We rented a cozy Air BNB in Heber and hosted Becca Tilley, Marianna Hewitt, and Brittany Xavier (aka Thrifts and Threads). Kaitlynn Carter, Sophie Elkus, and Witney Carson were also in town for the weekend, so we were able to hang with them a bunch too! Sundance is a crazy time in Park City. Main Street is filled with chaos and industry people buzzing around town. We made our way to handful events like the Robert Redford Sundance Kickoff Party, Nylon x Dream Hotels Event, Tone it Up Wellness Lounge, TAO Pop Up, and Chefdance. We also visited the Midway Ice Castle Park which is an absolute MUST to go see. The Montage Deer Valley also has a cute s'mores station set up everyday at 4:30pm that is open to the public. It was snowing hard every day which made for amazing photos, but man, it was a hassle getting around town. We had some good laughs trying to navigate the snow - where is a guy when you need one?!! 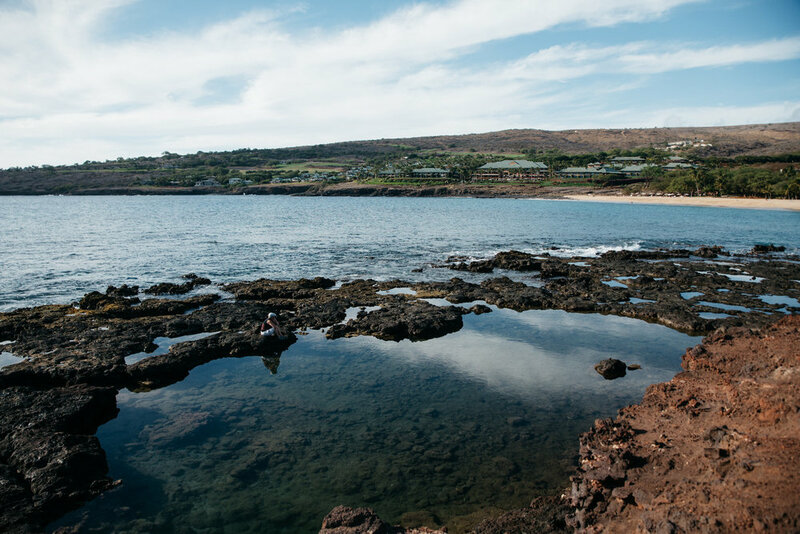 The island of Lanai is an undiscovered paradise. 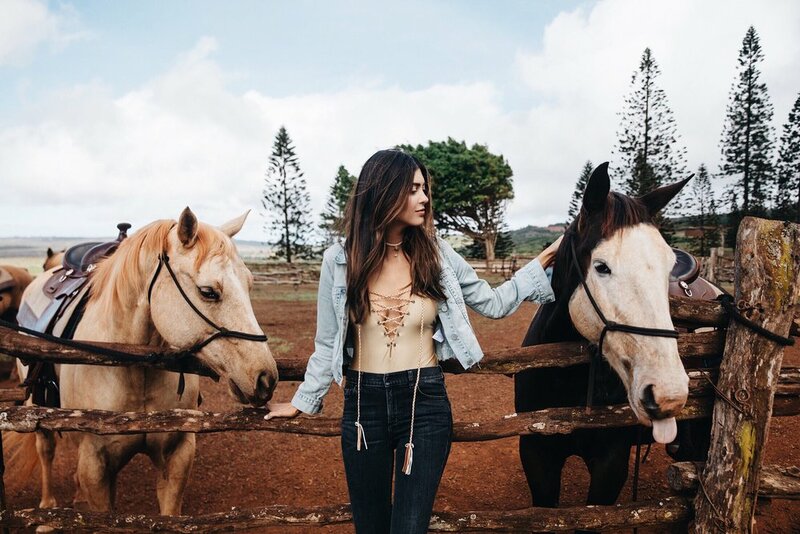 Foray Collective, The Venue Report, and Four Seasons came together this round for an incredible trip to Lanai. The Venue Report is a digital media company dedicated to find the best of the best experiences, venues and hotels. Foray brought along bloggers Margo and Me, Pam Allier, Sophie Elkus, Kaitlynn Carter, myself, and Foray co-founder Tiana Haraguchi. We also had my favorite photographer Derren Versoza join us to capture content. We flew from LAX to Honolulu, followed by a speedy 20 minute flight to Lanai. We arrived to the island with a warm aloha at the Four Seasons Lanai (leis, Mai Tai’s and all) as spent the evening settling in, getting familiar with the newly renovated property. On our way to dinner at the The Sports Bar and Grill, Kaitlynn and I noticed the Malibu Farm and Nobu (2 of our fav restaurants in LA) in the hotel! Day 1, I woke up at 6am (so unlike me) to watch the sunrise and take on the breakfast buffet with Pam at One Forty. Our first activity was a snorkel sail organized by The Venue Report, so we rounded up the crew to set sea! The boat was our personal playground as we sailed off to our snorkel point. We had an awesome time taking photos, drinking champs, and taking in the views of the crystal clear water. Dinner that evening was around sunset at NOBU, which all left us stuffed and wobbling back to our rooms! Day 2 was our mountain horseback riding adventure into the hills surrounding Koele. We arrived at the staples and I was introduced to my gigantic horse, Bitter. Our tour guide Joel was straight out of an old western movie, complete with the folk singing all the way up the trail. The ride lasted about an hour and had stunning cliff top views where we all stopped for a photo opp. 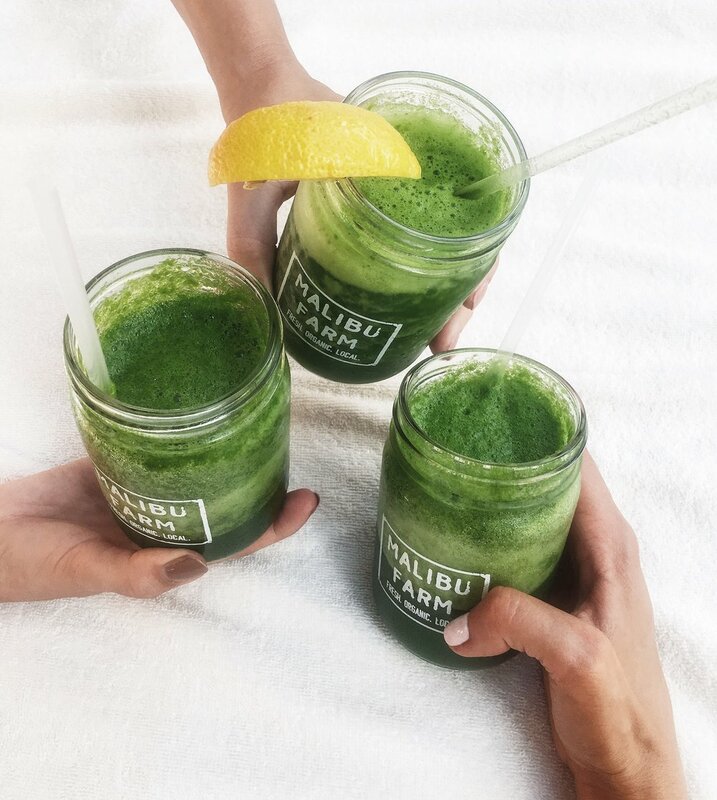 We headed back to the hotel to lounge by the pool cabanas and order lunch from Malibu Farm. Each of us also got poolside massage treatments which were unbelievable! Day 3 was our free day – yay! I spent most of that day at the poolside cabana with the girls catching up and having a good laugh. I also made time to explore the beach and hit the fitness center for a quick workout before our red eye that evening. You can shop all of my looks from the trip on FORAY COLLECTIVE. An unforgettable experience to L'Auberge de Sedona. I just got back from my trip to L'Auberge De Sedona and all I can say is what an UNREAL experience. This was the first getaway in a long time that I had the ability to be present in to moment, not thinking about emails, Instagram, texts, – whatever. With organized activities like forest bathing, sound healing, apothecary blending and stargazing, the trip was unlike anything I have ever experienced. 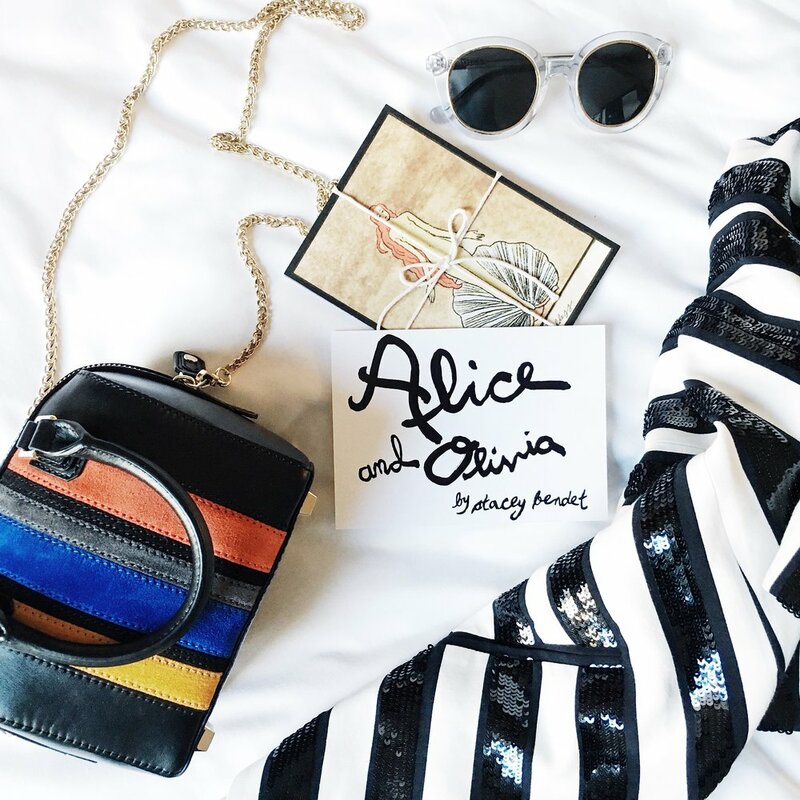 Foray Collective organized the getaway and brought along bloggers Becca Tilley and Naila. The flight to Phoenix was a quick 1 hour 40 minutes, followed by a 2 hour drive to Sedona. Once we arrived at the resort, it was time for action! We came in hot at 4pm and went straight into adventure mode. 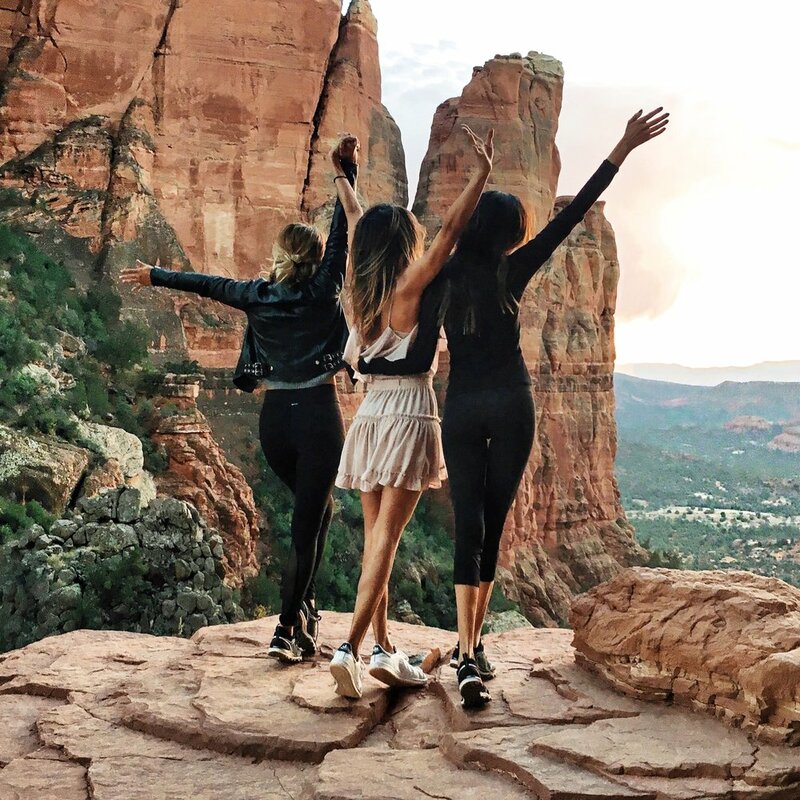 Knowing that the sunset was at 5pm, we jolted to our rooms to change, then headed the Cathedral Rock – a spiritual vortex hike with an epic view. Time was against us, so we ran- no literally, ran to the top of Cathedral in 20 minutes. We got there just in time to take in the breathtaking sunset. After the hike, we headed to 89 Agave for a much earned tequila tasting and Mexican feast. I especially loved the guacamole with pomegranate seeds, mango, and almonds – yum! We probably ate too much but hey, we earned it after that hike. Our second day there was raining, but we made the most out of it with activities around the hotel property. First, we headed to sound healing, where our instructor lead us through a 1 hour meditative session using Himalayan jars creating healing sound vibrations. Not gonna lie, I was a bit giggly at first. But towards the ended I was in a state of complete relaxation. Next off, we headed to forest bathing. And no – it’s not exactly what it sounds like. Forest bathing is a unique nature experience with reflective meditation. The 60 minute session begins with an instructor giving a brief introduction of the practice, followed by multiple exercises to practice being present and mindful. The instructor gave each of us eco-friendly journals to jot down our thoughts during each exercise. We all agreed that it was a great and much needed moment to unplug from the chaos to get in touch with the healing aspects of nature. With a clear mind, we headed to the L’Auberge Spa, where we had a custom blending bar to create personalized body scrubs and bath soaks – so cute! After quick nap, we polished off the day with a 3 course dinner at Cress – the food was delicious! On our final day, it was time to take on The Grand Canyon. Seeing the canyon has been on my bucket list, so I was really looking forward to this! Up an at it at 7am, we headed there bracing ourselves for the 2 hour drive. Our Pink Jeep Tour guide Ted was insightful and taught us about the history of the Grand Canyon during our drive up. Once we made it to our first stop, I was ABSOLUTELY STUNNED. It’s one of those places you look at and go - Is this real?! What is life?! It’s literally mind-blowing to think something like that can be on this planet. STAY: L’Auberge de Sedona – A 5-star resort experience. The rooms have wood burning fireplaces, outdoor showers, and the service is incredible. Definitely take advantage of the activities and amenities offered on site. HIKE: Cathedral Rock – The Hike House is a great place to start planning your hike. They have trail guides set up on their website and in their store, and they can also set up a private guide to hike with you. 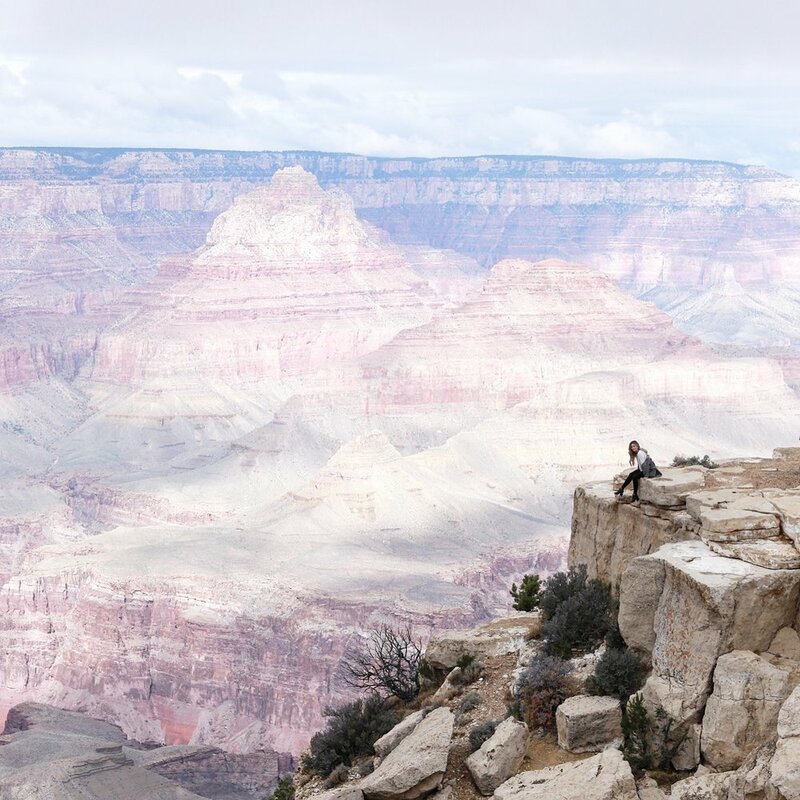 VISIT: Grand Canyon Pink Jeep Tours – The jeeps are able to take you where you wouldn’t be able to access on foot, so you’ll get picturesque views and plenty of photo-worthy moments. EXPERIENCE: Forest Bathing, Sound Healing, Apothecary Blending – All of these activities are offered through L’Auberge. RELAX: The Spa at L'Auberge – Try the facial! DINNER:Cress on Oak Creek – For a special occasion. DRINKS: 89 Agave or Etch Kitchen & Bar – 89 Agave if you're looking for a more relaxed vibe. Chef Jimmy Day's food game at Etch is next level. WEAR: Warm Earth Tones, Silver Jewelry, Embroidered Jackets, Ankle Boots, Felt Hat, Activewear. 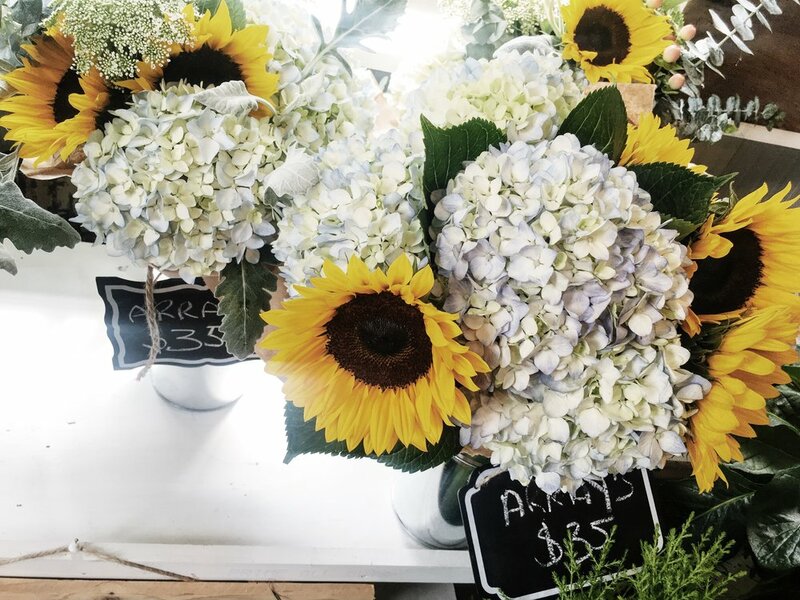 A summer weekend in The Hamptons with Foray Collective. I just got back from The Hamptons—South Hampton to be exact, and it was the most perfect end-of-summer vacay. It's a classic American destination that lives up to every ounce of hype it gets. I went with the Foray Collective crew - @kaitlynn_carter, @caraasantana, @margoandme, @beccatilley, and @racquel_natasha. It was my first time meeting Jenny aka Margo and Me and she is amazing - super genuine, sweet, funny, and SERIOUSLY stylish. All influencers stayed at Chris Burch's (as in Tory Burch's former husband) estate, Chris also owns Nihiwatu Resort on Sumba Island (#1 resort in the world where Kaitlynn and Brody got engaged) and I'm dying to go there. The estate is in an upscale, quiet, and incredibly charming neighborhood and the grounds were massive. We're talking rose gardens (I couldn't get over the landscaping throughout), beautiful rooms, and the dreamiest pool area. It was basically a magical playground for adults. We had a chef who served farm-to-table goodness 24/7—plus wine, obviously. We arrived Thursday and walked straight to the beach, then to Wolffer Estate Vineyard for sunset + more wine. Dinner and drinks were back at "our" house that night. Friday, we took a catamaran out from Sag Harbor. We brought sandwiches and a cheese platter (essential!) and the girls color-coordinated bathing suits from Solid and Striped. They are my favorite brand to wear in The Hamptons because the Americana vibe is fitting and uber chic. 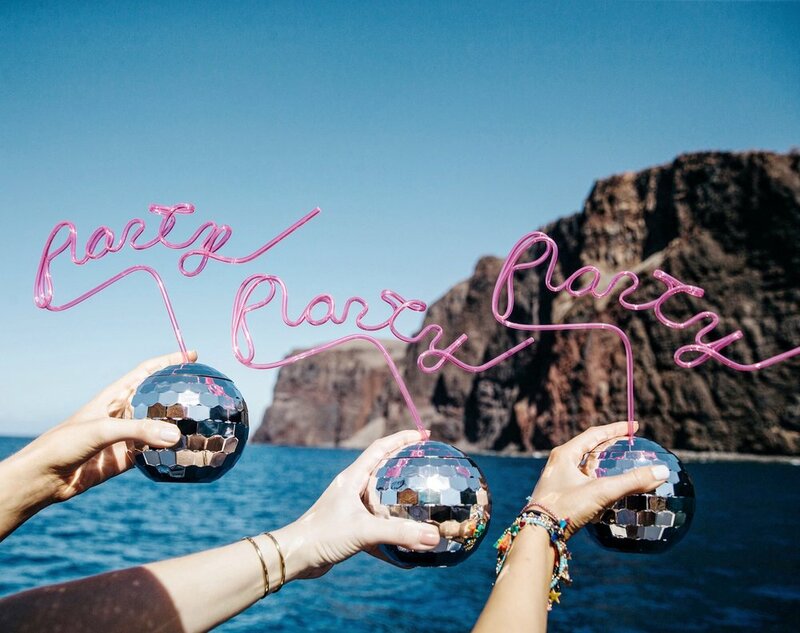 We sipped rose and danced on the boat all day—it was the ultimate girl time! 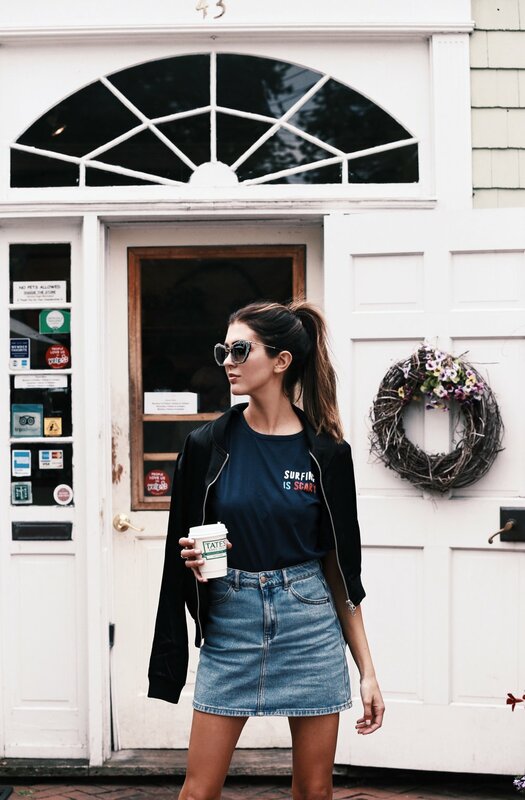 On the way back, we hit up Grindstone Coffee + Donuts which is a must if you're ever in Sag Harbor. MMMM! Saturday, Foray hosted a 'Secret Garden Soiree' at our estate. We had about 60 people join and everything was in the backyard. There was a lounge area on the grass with boho pillows and blankets—the coziest summer afternoon. We had everything from a monkey to famous magician Sean Borland, who freaked us out (in the best way) all day. The event was a total success and too much fun! After the party, the whole crew went to a packed dinner at Moby's in East Hampton. I'd highly recommend the margarita pizza and summer squash, plus the cocktail list was beyond amazing. Sunday was our last day and we were sooo sad to leave. I HAD to stop at Tate's Bake Shop (I love their gluten-free cookies and buy them at Whole Foods on the reg). Becca and I swooped up coffee + GF blueberry muffins before saying our goodbyes. I'm already daydreaming about Summer 2017 in The Hamptons. For now, back to the West Coast! PS - You can shop ALL of my looks from the trip HERE.